We have some shower activity across North Alabama with a few spotty showers extending down into the northwestern parts of Central Alabama. This activity is pushing off to the northeast. We do see some very light returns showing up over the extreme southern parts of the area as well. I’m not sure if these are reaching the ground, but if they are, it wouldn’t be much more than drizzle to very light rain. Temperatures at this time were in the mid-60s to the mid-70s across the area, with Demopolis as the current warm spot at 76 degrees. The cool spot was Haleyville at 66 degrees. Birmingham was sitting at a nice and mild 73 degrees. Taking a look at the latest run of the HRRR valid from noon through midnight, we see that a few scattered showers remain possible over the northwestern corner of North/Central Alabama, while it looks that the rest of the area may just stay dry. Skies will remain mostly cloudy across the area with a few breaks of sunshine and afternoon highs topping out in the lower to mid-70s from north to south. Rain chances will be small throughout the area, around 20-30% north of the I-59 corridor and 20% and less south of that. Any shower activity should be over by the time we reach the midnight hour but some fog will more than likely develop over the southeastern locations. Overnight lows will be in the upper 50s to the mid-60s from east to west. COULD WE SEE RECORD BREAKING WARMTH ON THURSDAY??? Nearly all of Central Alabama will remain dry on Thursday with partly cloudy to mostly sunny skies, but a few isolated to scattered showers may occur over the extreme northwestern parts of the area. Afternoon highs will top out in the upper 70s to the lower 80s across the area from north to south. At this point, the current record for Birmingham is 76 set back in 1999. We’ll make a run at the record and I believe we may just break it. My forecast high is 78 degrees. 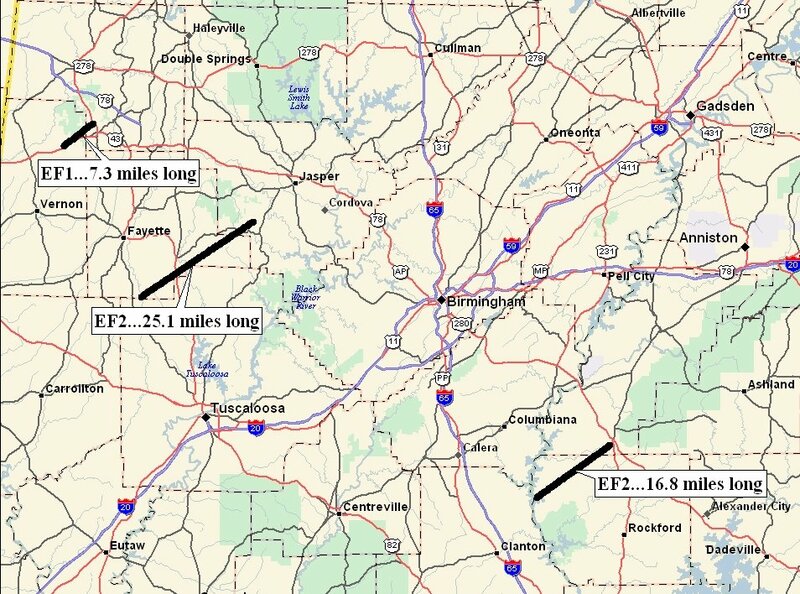 2008 – A warm front moved northward across Central Alabama early Monday, February 5th. 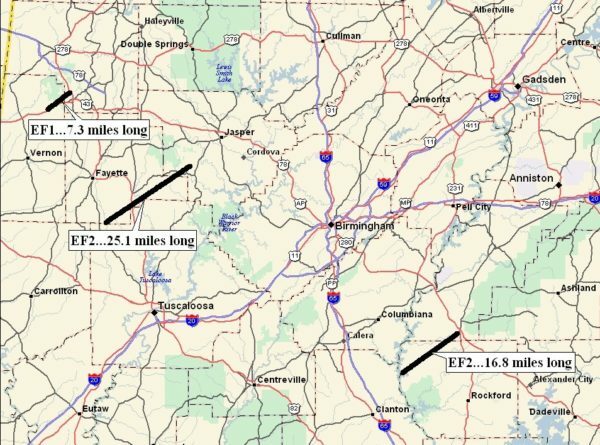 The southerly flow behind this warm front brought an unseasonably warm and moist airmass northward and into Central Alabama. The southerly flow, occasionally gusting to 30 mph or more, continued Monday and Tuesday. Afternoon high temperatures were near record levels and rose into the 70s and 80s each afternoon. The surface dew points surged into the 60s indicating a very moist environment. A strong upper-level system and its accompanying surface cold front approached Central Alabama just after midnight on February 6th. With the warm and unstable airmass in place, the added lift sparked several supercell thunderstorms. 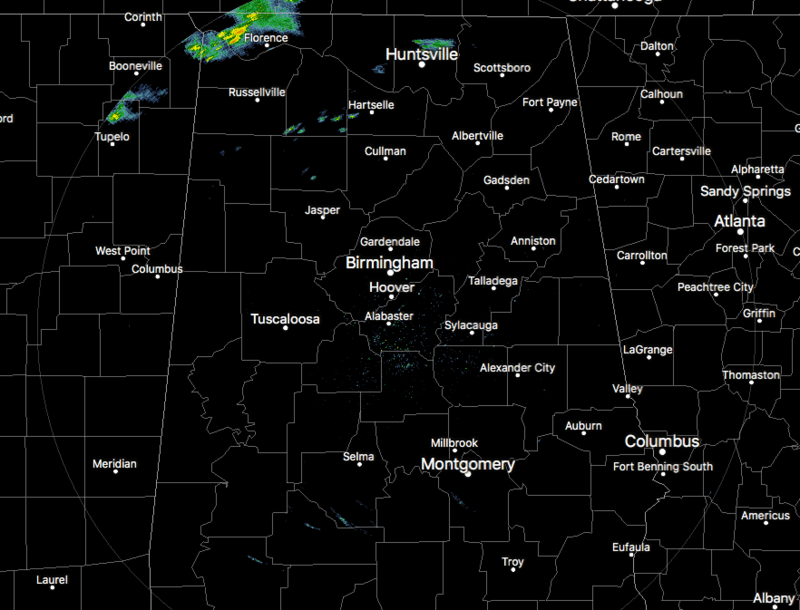 These supercells produced damage in many locations across Central Alabama. Supercell thunderstorms exhibit persistent rotation through a depth of the atmosphere and frequently produce tornadoes, wind damage, and large hail.